Powers/Abilities: "Rainbow control" (similar to the later Green Lantern's powers); this only works when light is shining on him, but he can overcome this weakness too through use of an "ingenious solar battery". He can fly at the speed of light, and shape his rainbow trail at will. 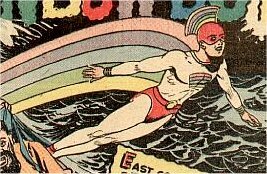 History: Having somehow gained superhuman "rainbow" powers, Jay Watson became the crimefighting Rainbow Boy, often working alongside fellow hero Hydroman. Comments: Thanks to Jack Staik for information on Rainbow Boy's powers.